Lokman Noor Adam is the evil face of the Umno-Baru thug. The video below shows the Umno-Baru thugs attacking the students. 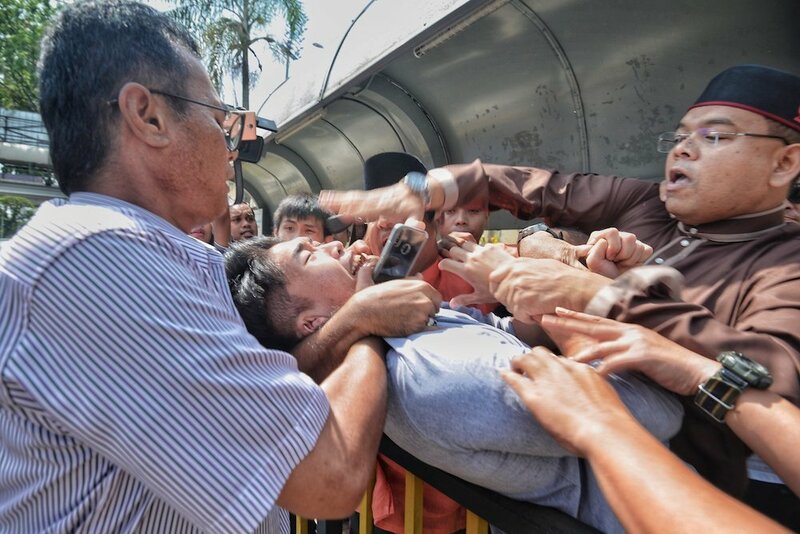 When will the IGP, Fuzi Harun arrest Lokman Noor Adam, and his supporters, for attacking a group of students who were merely staging a silent protest? Below, is the FMT video showing the attack on the Universiti Malaya students. Lokman, is the chief samseng from Umno-Baru. He is also an Umno-Baru Supreme Committee member. There is no denying that disgraced, former PM, Najib Abdul Razak is a penyamun, as described by current PM, Dr Mahathir Mohamad. He is also a weak leader, who cannot control his violent mob. Notice how very few Umno-Baru politicians, have criticised the violence of their members. Najib only criticised the attack on the students, probably because he found out that the attack had been filmed by reporters. The politicians criticise the attacks on Muslims overseas BUT at home, they stay silent when Umno-Baru thugs attack fellow Malaysians. We must all stand up to bullies and thugs. Umno-Baru and Najib Abdul Razak are NOT fit to hold power in Malaysia again.